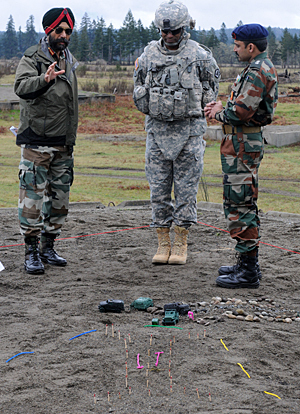 Indian and US Army soldiers showcased their engineer operations and systems skills to each other recently at the Joint Base Lewis-McChord, U.S.A. During the visit the Indian Army officials discussed and compared route-clearing procedures and received other engineer training classes. "We showed them tactical on the ground aid, combined arms breaching, just to show them what capabilities we bring to the fight, so they can learn from us and take it back to their country as well," said 1st Lt. Aditya Iyer, with 555th Engineer Brigade, I Corps, US Army, liaison officer during the event. During conversations with the delegation, Iyer learned that the most complicated threat the Indian Army faces is improvised explosive devices planted by terrorists and insurgent militants, a threat faced by both military and paramilitary forces. "They want to know how other countries who have encountered IEDs through Iraq and Afghanistan, are trying to fight it and what we've learned throughout our years of counter IED fights," Iyer said. To show what U.S. Soldiers use to counter IED, the engineers used the mine clearing line charge (MICLIC) and hand-held mine detectors in a live fire range simulated minefield. 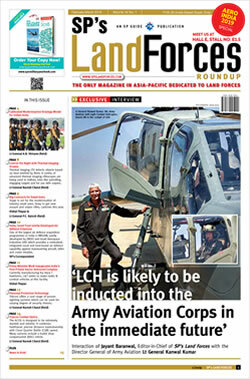 "They noticed a lot of similarities, we have more mounted capabilities then they have," Iyer said. "They conduct the same operations but mostly dismounted." The Soldiers performed all tasks as though it were a real-life scenario to give the delegation good mine clearing procedures. 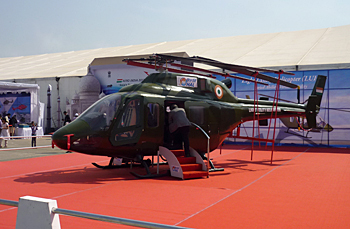 "The Indian Army officials truly believe this was a fruitful event," Iyer said. He said they are going to take back and send recommendations hopefully to continue these kinds of training exercises and implement the procedures learned.